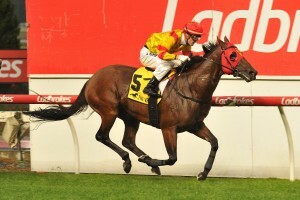 Lindsay Park’s improving sprinter Thronum is continuing to firm in the betting for the Group 1 $500,000 Ladbrokes C.F. Orr Stakes (1400m) at Caulfield today. The Lindsay Park trained Thronum, above, is firming in the betting for the 2018 C.F. Orr Stakes at Caulfield. Photo by Ultimate Racing Photos. The Lindsay Park Team of David and Ben Hayes and Tom Dabernig are testing Thronum in Group 1 company for the first time since joining the stable in 2017 and the four year is marked at $9 on race morning with Ladbrokes.com.au after touching $11 overnight. Thronum was originally prepared by Gai Waterhouse and Adrian Bott and as a three year finished twelfth behind Astern in the 2016 Group 1 $1m De Bortoli Wines Golden Rose (1400m) at Rosehill. The Snitzel four year old has won twice for the Lindsay Park Team and was given his chance to step up to Group 1 level following his all the way win in the Group 2 $200,000 Carlton Draught Australia Stakes (1200m) at The Valley on January 26. Co-trainer Ben Hayes said that Thronum deserves his chance to show his wares at the highest level and is confident that Mark Zahra will give him every opportunity from barrier eight in the C.F. Orr Stakes field that has been reduced to thirteen runners following the race eve scratching of one of the main chances Black Heart Bart. “He’s thrown in the deep end but he deserves his chance,” Ben Hayes told racing.com. “His win in the Australia Stakes was good. He’s up to 1400m and hopefully the tempo will suit and he can get a nice run just off the speed. The early withdrawal of Black Heart Bart because of a foot problem has still left trainer Darren Weir with two top chances, the $4.20 favourite Tosen Stardom and $8 chance Brave Smash. The James Cummings trained Hartnell is also in the mix at $5 and is stepping out for the first time in the Autumn after finishing down the track when twentieth behind Rekindling in the 2017 Group 1 $6.25m Emirates Melbourne Cup (3200m) at Flemington on the first Tuesday in November.